Have you ever wondered when strawberry season starts? Or when California quail hatch? Or maybe when salmonberries ripen? 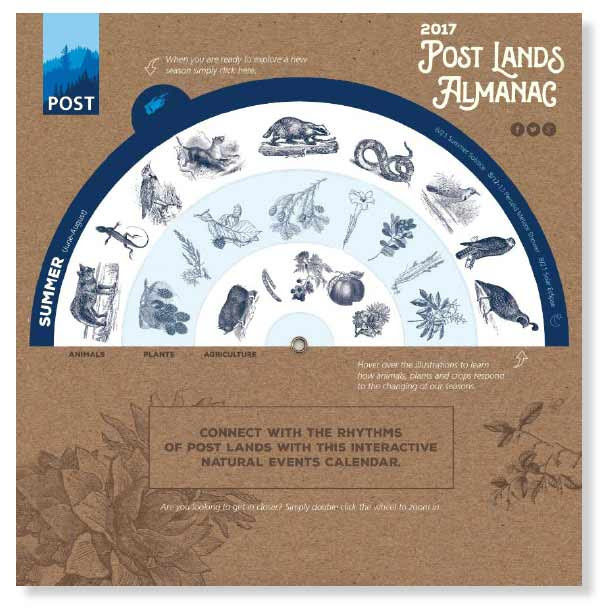 Then you’ll love our new 2017 POST Lands Almanac – an interactive calendar that with a click of your mouse reveals the natural events happening right under our noses. Knowing the natural rhythms of the land helps to connect us to nature and enriches our experiences in open spaces. That’s why we created this calendar, to make it easy and fun for you to connect more deeply with the land you’ve helped protect. Ready to jump in? Start here and revel in the plants, animals, crops and stars that define each season. To be good stewards of the land we have to understand and listen to nature’s rhythms. At POST, we use the latest information and technology in conservation science to inform our land stewardship strategies. Learn more about this work and what we’re doing to care for the 75,500 acres we’ve helped protect.